Whenever I think of Geena Davis, I can’t help but also think of girl power. Growing up a blossoming feminist, “A League of Their Own” was one of my favorite movies just because of that. It was important to see women who represented strength, grace, and integrity – and Geena’s moving portrayal of the stalwart Dottie Hinson gave us someone to emulate. But what’s really special about that film is that even if you didn’t necessarily relate to Dottie, there were so many complex, three-dimensional female personalities represented that it was easy to see yourself in one of them – the always-underestimated younger sister Kit, the spunky, passionate Mae, the tomboy Doris, or the awkward Marla. But this isn’t always the case with female representation in the media, even in 2019. In fact, according to research from the Geena Davis Institute on Gender in Media, for every 1 female character there are 2.5 male characters. In the era of #MeToo and TIME’S UP, it’s critical that we see more depictions in the media and film that represent all of us. And Geena has made it her mission to engage film and television creators to dramatically increase the percentage of female characters — and reduce gender stereotyping — in media made for children 11 and under. 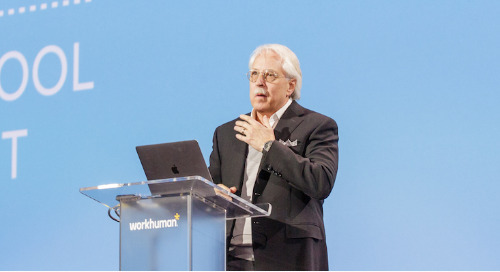 Today, on this last day of Workhuman 2019, she and Fortune Magazine’s senior editor Ellen McGirt had a candid discussion about what’s necessary for women to receive parity in all sectors, how we can eliminate unconscious bias in our hiring decisions, what’s next for the #MeToo and TIME’S UP movements, and what HR leaders can do to respond to and prevent unacceptable behavior in the workplace to truly make the future of work one where everyone feels safe and included. She became an actor – not an actress. How one data point led to a research institute. When Geena became a mother, she wanted data on how many female characters were there for children her age and was astounded to see far more male characters than female characters in what we’re making for the littlest kids. Surely, she thought, we should be showing them that boys and girls share the sandbox equally. This turned into many conversations with people in her industry, who seemed to be genuinely unaware of the problem, and sparked 10 years of research. She pointed out that films with a female lead now make 31.8% more money at the box office than films with a male lead. But all too often, the function of females in media is to serve as eye candy, and they’re either hyper-sexualized or stereotyped. These depictions fail to reflect the steady progress women have made in industries. So in this case, art isn’t even imitating life – it’s painting an even bleaker picture than reality. The situation is compounded for minority characters. Although people of color are 40% of the population, only 17% of characters are not white. Geena’s solution is to show from the beginning, in programming for younger children, that boys and girls are equal. Why not tap into the uber influential power of the media – the one that inspired thousands of girls to learn archery when “The Hunger Games” and “Brave” came out in 2012 – and change what the future looks like now through what people see. The media can solve the problem it created. Think of how different our world would be if kids could grow up without these biases? The TIME’S UP trajectory marks a huge shift. Her advice for leaders looking to keep evolving at a senior level? “This is the way the world is going. It’s going toward parity and we better get on board with it right now. That takes courage and a willingness and openness that you have to embrace. That’s why I’m so keen to teach people we have unconscious biases because then they realize they have to change.” She recommends making conscious proactive policies to create the change.